Dr. Allen Schoen is one of the elders of integrative veterinary medicine, and has dedicated his professional career to the scientific advancement of complementary and alternative veterinary medicine. He has been publishing and speaking on the scientific basis of acupuncture for over 20 years, and has been using herbs for many years. Allen is on faculty at two veterinary schools (Colorado State and Tufts Universities) and teaches for the Chi Institute for Traditional Chinese Medicine. 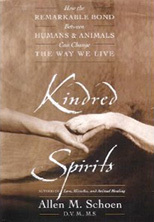 He is the editor ofVeterinary Acupuncture: Ancient Art to Modern Medicine, (Mosby, 1994, 2001), co-editor of Complementary and Alternative Veterinary Medicine (Mosby, 1998), author of the award winning book, Kindred Spirits, How the Remarkable Relationship between Humans and Animals Can Transform our Lives (Broadway-Doubleday, 2001) and author ofLove, Miracles & Animal Healing, (Simon & Schuster, 1995). Dr. Schoen has lectured all over the world, and is the recipient of multiple grants and awards for his work and contributions to veterinary medicine. In addition, he maintains a four veterinarian referral practice in large and small animal complementary and alternative veterinary medicine. Dr. Schoen was kind enough to give us some of his very limited free time for this interview. Why do you think herbal medicine is gaining popularity now, in the age of miracle drugs and surgical advances? Medications and surgery, as much as they have progressed, still have significant potential side effects and still do not address many conditions that are addressed with herbs. in my mind i have a beautiful, exquisite, blossoming, colorful, joyous, healthy, bountiful garden. In the physical realm, i have been way to busy to cultivate one on the earth. What would you advise a new veterinary graduate today? Apply for an internship in internal medicine and become as knowledgeable and capable in the best western medicine has to offer so you know and understand that option, along with keeping an open mind and studying complementary therapies such as nutrition, herbs, acupuncture, chiropractic, physical therapy as well. That way you will truly become the integrative veterinarian of the 21st century. That is the way. In addition, study mind/body medicine and understand the impact that your thoughts and the choices you make have on the way you practice and the way you live. Choose love over fear. What was the best professional advice you ever received? hmmm. don’t go to vet school? (just kidding!). Integrate acupuncture and complementary therapies into an integrative approach along with western medicine. Introduce these therapies in a nonadversarial, scientific way. Dr. Bill Kay, Chief of Staff and Dr. Martin DeAngelis, Head of Orthopedic Surgery at the Animal Medical Center in New York, in 1982, suggested that that was the best way to succeed with my vision of integrating these therapies into veterinary medicine. What is the most exciting change you’ve seen in veterinary medicine during your practice life? The acceptance of complementary therapies by veterinary schools and the AVMA, AAEP and other professional organizations as an integral part of veterinary medicine. The 1996 AVMA guidelines on complementary therapies [which for the first time defined certain ‘alternative therapies and suggested their place in veterinary practice, Ed.}. The development of complementary therapies programs at CSU, Tufts, U. Fla. and other veterinary schools. Who has inspired you in veterinary medicine? 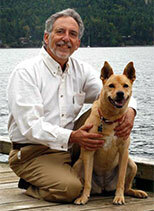 Dr. Sheldon Altman was my very first teacher of veterinary acupuncture and my great inspiration and role model. Dr. Bill Kay and Dr. Martin DeAngelis at the animal medical center when they supported me despite the skepticism and cynicism of the majority of veterinarians at the Animal Medical Center. Jane Goodall for all she has done for animals. Spiritual teachers such as Garchen Rinpoche, who after 20 years in a Chinese prison camp, said his greatest fear was losing compassion for his torturers. The Dalai Lama, Jesus Christ, G-d, all that is…nature, and my dog Megan. absolutely, positively, without a doubt, both! What books do you consider essential for the veterinary herbalist? My current favorite is Dr. Xie’s Chinese Veterinary Herbal Handbook. What was the last really great book you read, of any sort? Go inside yourself, be quiet and offer what you truly feel is best for the animals you are treating, treat all animals as you would like to be treated. Be still, know G-d, Love others as yourself. Give 100% without attachment to outcome. Choose love over fear. What is your favorite sanity check? Being still inside and following my breath and getting in touch with the inner joy and peace of all that is in that quiet still moment between breaths. Has your chosen path in veterinary medicine made it difficult for you at times? If so, how? Constantly…When I first realized that acupuncture really worked and I had to stand up and defend it to cynical or skeptical colleagues at a time when there were only a handful of us practicing in the U.S. It was challenging to stay positive, loving, nonadversarial despite the ridicule and cynicism of many colleagues. Following your heart vs. economics is always a constant challenge. I always share what I would do if it was my own animal companion. Sometimes that does not agree with what a client or colleague would choose. It is a constant challenge and wonderful opportunity for me not to judge others for their choices. Standing up for what you truly feel is best for the animal when other colleagues disagree. When choosing a career path in natural medicine, you are sometimes choosing a more economically challenging part of the profession. You do not acquire the income as if you would choose to practice conventional medicine. However, the exception to that is offering integrative medical approaches, providing the best of both worlds. It was also challenging to be interviewed by writers, tv personalities, radio hosts etc. who were cynical and skeptical and trying to get you boxed into a corner. This was a wonderful opportunity to practice verbal aikido, the Japanese art of not fighting, with words. It was a constant reminder to choose words carefully, because you will often be misquoted, even when you do choose them carefully. It has also been challenging as well as a wonderful opportunity to choose love over fear, when dealing with the recent ascent of certain extremist skeptics and cynics who are committed to ridiculing all you do. It is an opportunity to have great compassion for the pain that they must be in, in order to be that adversarial and negative. It was also challenging finding myself to be the spokesperson for the scientific basis of complementary veterinary medicine to all the veterinary schools, associations etc. in the early days of the evolution and development of this field. I felt there were great expectations, responsibilities and demands on me by the profession, colleagues, and media. I felt concern that I would disappoint people, the profession, colleagues and let them down. I was merely one human being following my heart, doing the best I could to help the animals under my care and trying to share the wisdom from those experiences with others in order that more animals could be helped. Also, there were times when colleagues in the holistic field were adversarial because they felt I was trying to be too scientific. So, there were times, when one tries to follow a middle path, an integrative path, bridging the gap between the two polar sides of adversarial extremists in holistic medicine and extremists in conventional medicine and rather than gaining approval from both sides, you actually get attacked from both sides. 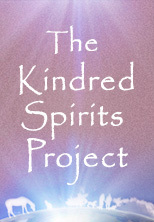 This was a wonderful opportunity for practicing understanding, being nonjudgmental, and compassionate. I did not always succeed as often and well as I would have liked to.